Der Panzer 58 Mutz ist ein deutscher premium mittlerer Panzer der Stufe 8. Der erste Prototyp, 1953 in der Schweiz entwickelt, besaß ein 90-mm-Geschütz. Ein zweiter Prototyp mit britischem 20-Pfünder-Geschütz wurde später gebaut. Am Ende wurde eine Serie aus 10 Fahrzeugen gebaut, die 105-mm-Geschütze hatten und diese blieben bis 1964 im Dienst. Danach dienten die Fahrzeuge als Grundlage für den Panzer 61. Der einzige bis heute verbliebene Panzer 58 besitzt ein 20-Pfünder-Geschütz und ist im Panzermuseum Thun in Bern zu sehen. 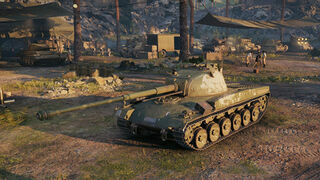 The Panzer 58 Mutz is a Swiss tank (though placed in the German tech-tree) that plays very similar to other Tier VIII support mediums like the Indien-Panzer or the Centurion Mk. I. Using what is essentially the Indien-Panzer's 9cm gun, the Panzer 58 Mutz should be played as such; picking off targets from long range, using terrain as cover, and giving fire support where it is needed. The accurate and high-penetrating 9cm gun can hold its own even in Tier X matches, but a careful balance of AP and APCR ammo is needed as the Mutz can only carry 48 rounds. The Mutz is fairly mobile for a medium tank, but close-range brawls are far from recommended; the armor on this tank cannot take sustained amounts of punishment. Flanking heavier opponents is a viable tactic so long as backup is at hand. There are some aspects to the Mutz that need specific attention. The turret, while rounded, offers a large profile and is poorly-armored. The gun-mantlet is small and unreliable for bouncing shots, while the hull is horribly lacking in armor. 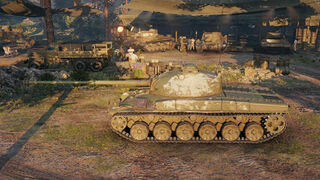 The highly sloped front of the tank does get a surprising number of ricochets. Beware of artillery and tanks with large-calibre guns. They are liable to take out huge chunks of your HP with HE rounds, if not kill you outright with one shot. These problems are offset by the Mutz's mobility and gun-depression. As with other support mediums, expose yourself only when needed and find cover as a matter of habit. 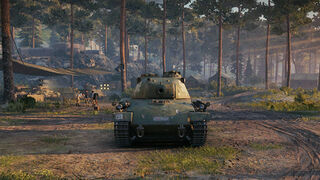 The 9cm gun rewards players who know how to keep this tank alive and firing in any match it may see. 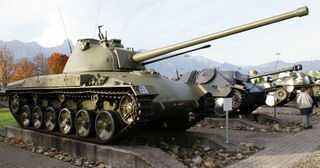 The Mittlerer Panzer 1958 or Panzer 58 was a medium tank of Swiss design. Twelve tanks were produced and later converted to Panzer 61s.